In today's blog post we take a look at the latest trade statistics numbers between South Africa and Germany, and while yesterday we looked at South African exports to Germany and the USA, today we will focus on imports by South Africa from Germany. The bar chart below shows the annual value of imports per year from Germany since 2010. As readers can see the peak imports by South Africa from Germany was in 2016. 2017 saw lower levels of imports from Germany, and predicted imports for 2018 is predicted to be even lower than the levels reached in 2017. So what exactly are we importing from Germany ? The graphic below shows the Top 50 product groups being imported from Germany. 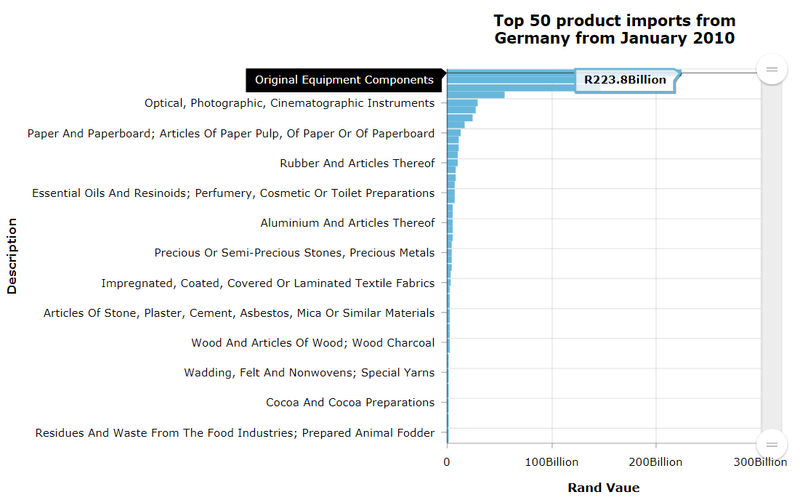 The chart above shows the Top 50 product imports from Germany into South Africa from the start of 2010. And top of the list is original equipment components, which refers to parts for motor vehicles which is imported into South Africa. These parts are imported into South Africa, cars are then assembled in South Africa and then exported to the rest of the world. In particular right hand drive vehicles are imported in South Africa and then exported to the UK. In addition to vehicle parts being a big import from Germany, actual vehicle imports are another big import from Germany. While we do manufacture vehicles from various Germany brands, they are largely for the export market, meaning that a large number of German vehicles sold in South Africa are still imported and not manufactured locally.